Miami, FL - We finished the US Sailing's Rolex Miami OCR regatta with a silver medal. 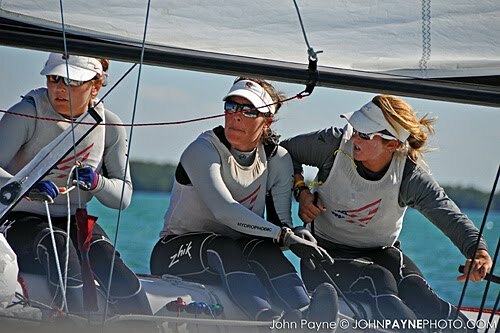 We lost the women's match racing finals 3-1 to France's Claire Leroy and team, who sailed a very good series. The bronze went to our USSTAG teammates, Sally Barkow and team. We are happy with our overall performance this event. However, we do wish we could have back some moments in the finals. The first two races of the series, Claire and team hit the shifts correctly up the first beat and launched into the lead and took the two races handidly. The next two races, however, were a different story; much more intense. The third race, we were behind off the line and around the first lap but up the second beat, we sailed smart and took the lead and the race. The fourth race was the most intense race of our whole regatta. There were four or five lead changes throughout the whole race. Off the line, we were to the right and were ahead, but shortly thereafter, a big left shift came in and put Leroy into the lead by one length. Coming into and at the top mark, Leroy held the advantage, as well on the downwind leg. Up the next leg, Molly and Debbie found all of the correct shifts which then put us one length ahead at the top mark. By now the wind had died to about 6kts so we knew going downwind to the finish was going to be very tough. We took it in turns to roll over the top of each other and each of us took the lead several times. In the end, it came down to who could roll the other team last before the finish. Unfortunately for us, she rolled us just before the finish and we couldn't get it back in time. This gave her the third win of the series and the gold medal for the event. Like I said, we were disappointed after the racing because we feel as though we gave away a couple of races, but after a debrief and evaluation of the whole regatta, now we are excited to have sailed well all week long and to come away with a silver medal. Next up for us, we have two weeks off as a team. We are looking forward to our break before we start training again on February 14th. We would like to thank Carmeuse and Trinity Yachts for their continued support of our women's match racing campaign for the 2012 Olympics in London. We would also like to thank US Sailing Team AlphaGraphics (USSTAG) and its sponsors for their support. Also, thank you to our private donors. Please remember that any and all donations/contributions to our campaign should be made payable directly to The Sailing Foundation of New York (tax deductible) memo'd Anna Tunnicliffe, or to Anna Tunnicliffe.